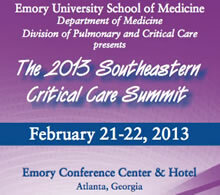 The 2013 Southeastern Critical Care Summit takes place Feb. 21 and 22 at the Emory Conference Center. Critical care is one of the most resource-intensive areas in U.S. health care, but despite substantial medical advances in the past decade the quality of critical health care delivery is known to vary significantly. The 2013 Southeastern Critical Care Summit will provide targeted education to a variety of critical care medicine providers with the aim of improving care across the care spectrum. The Summit will be held Feb. 21 and 22 at the Emory Conference Center and Hotel and is sponsored by Emory University School of Medicine, Department of Medicine, Division of Pulmonary and Critical Care Medicine. The Summit will focus on improving patient care by providing targeted education to multi-professional health care stakeholders on common critical care conditions and procedures. The program will use interactive and case-based lectures from the health care community at all levels (administrators, physicians, mid-level providers, nursing and respiratory therapy personnel), as well as hands-on teaching. Topics of particular importance (i.e. prevalence of critical care) or controversy will involve roundtable and small-group discussion, breakout sessions and procedural education. Early Bird registration for the Summit is $135 per day or $225 for both days if registered by Feb. 6. (Feb. 7 and beyond, registration is $175/$275). Registration includes the printed Summit course syllabus, continental breakfast and buffet lunch, refreshment breaks, exhibitor interactions and other amenities to create a rewarding learning experience. For more information and to register for the 2013 Southeastern Critical Care Summit, go to http://medicine.emory.edu/divisions/pulmonary/critical-care-summit/.